About 614 times a day I take a phone call or answer an email that is essentially the same question: “How sharp is this lens?” It’s no different in online forums (ok, actually forums are a lot worse) where pages of arguments drone on comparing the results of this bench-test lab review, these MTF charts, etc. You rarely see unanimous agreement. Of course, some disagreement is going to come from people who had a lens-camera mismatch when they tried their one or two copies, others from folks who really got a copy with bad sample variation. And some just because people have differing expectations and experience. In reality, though, we get so fixated on sharpness results from MTF charts and bench lab tests that we hardly ever talk about all the other things that can be of critical importance in a lens. Critically important, but often ignored or forgotten, partly because we get so fixated about sharpness, and partly because they’re disguised in a flurry of initials, abbreviations, and marketing hype. My point is that we fixate on absolute sharpness which is measured in a lab, on a tripod, focusing on a static target under controlled lighting, often using live-view focus bracketing to get the very best image a lens is capable of delivering. Such tests show how sharp a lens can be under ideal conditions. But there are a lot of other factors that go into determining how good the images will be under real-world shooting conditions, where subjects move, lighting changes, the shots are handheld, etc. A quick example using some excellent lenses that people found disappointing. I had a customer the other day tell me how disappointed he was with the Nikon 16-35 f/4 lens, since I’d promised him it was very sharp. I asked to see some images and the ones he sent were exceptionally sharp. When I investigated further, it turned out he was unhappy with the barrel distortion the lens had at 16mm. In his mind, a sharp lens would not exhibit distortion. Another asked what our sharpest, wide aperture, 85mm lens was, nothing else, just what was the sharpest. After receiving my recommendation he was livid to find all of his shots were blurry. When we examined the lens after his rental, it was tack-sharp so I got him to send some sample images. The problem was obvious: he was photographing a mixed martial arts event and the lens he chose is notoriously slow to autofocus. By the time it had achieved focus, the action had moved elsewhere and the lens was out of focus when he snapped the image. Every time. He had very sharp images of the space where the fighters had been a split second ago. So I thought we’d consider some of the other factors should be considered for real-world shooting, rather than just focusing on what’s the sharpest lens in the lab. A lot of these things are important, but they sometimes get lost in the babble of marketing initials stuck on the side of most lenses. Most people know aspherical elements are good things, but most aren’t really sure what they accomplish. Spherical lens elements can’t bend light rays to a perfect point on the sensor, especially light rays coming from the edges and corners of the lens. Aspherical elements help focus edge and corner light rays sharply, preventing coma distortion (smearing that makes points of light look like a comma) and other distortion, especially in wide angle and wide aperture lenses. All aspherical elements are not the same, though. The highest quality aspherical lenses are ground and polished from glass blanks, and generally found only on the most expensive lenses. Molded aspherical elements are produced by pouring molten glass into an aspherical metal die. These are of good quality, although usually not as complex and corrective as ground aspherical elements. They are used in many better quality consumer or pro lenses. Hybrid aspherical elements are made by placing a molded plastic aspheric element on top of a spherical glass element. Generally found in consumer grade lenses, they probably are more marketing hype than of real benefit. How Important is It? Very important for wide-angle and wide aperture lenses. A bit less important for telephotos. Common Marketing Gimmick: Saying “hybrid aspherical element” like it’s a good thing. These have more names than you can remember: Fluorite, UD, ULD, SLD, etc, etc. The basic premise of these elements is they bend all wavelengths (i.e. colors) of light the same amount, reducing or eliminating chromatic aberration that occurs with standard glass that bends red light less than blue light. There are no standards saying how effective the glass must be to be called apochromatic. Every manufacturer has their own formula which they keep as secret as my grandma’s pecan pie recipe, and each is designated by its proprietary name. And, in reality, the apochromatic glass is only a part of a lens element and only as effective as the lens design. But, in truth, they all seem to work to some degree. How Important is It? Very, if you don’t like post-processing. Moderately. if you shoot RAW and don’t mind correcting in post-processing. Probably more important with telephoto lenses than wide angles. Lens coatings are extremely important for several reasons, most of which involve reducing light reflection. Reducing light reflection allows more light to reach the sensor, creating a brighter image. Reflected light scattering in the lens also reduces contrast, and light bouncing back and forth within the lens can sometimes cause ‘ghosting’, a dim secondary image that may be seen when photographing lights in a dark background. For both, lenses and filters, multiple coatings are preferable to single coatings. Sub-wavelength coatings are certainly more effective than a classic single coating, and may be more effective (and almost certainly are less expensive to apply) than multiple coatings. How Important is It? Well, these are excellent coatings, no question. But I struggle to find good information showing how much better they are than a good multi-coating, which can be 99% effective. Common Marketing Gimmick: Everybody’s got a sub-wavelength, nano, or whatever-else-they-want-to-call-it coating now. It’s gotten to be a dreary marketing catch-all like “natural and organic”. Cyanide is natural and organic, it comes from recycled peach pits, but that doesn’t make it good for you. Manufacturers go to some fairly obvious lengths to disguise the type of autofocus motor in lenses sometimes, and it can be critically important. The best autofocus motors are ring-type ultrasonic motors (USM). These are fast and quiet. Canon calls their version Ultrasonic motor (USM), Nikon’s Silent Wave Motor (SWM), Sony’s SSM (Supersonic motor), Sigma’s HSM (hypersonic motor), Tamron’s USD (ultrasonic silent drive), and Olympus SWD (supersonic wave drive) are all similar. The ultrasonic motors are more expensive, and the manufacturer will definitely slap their proprietary initials on the barrel when the lens comes with an Ultrasonic motor. Generally, if the lens doesn’t have the manufacturer’s designation for an ultrasonic motor, it has a mechanical geared motor. However, Canon calls their slower, noisier, geared motor micro USM instead of just not making comments about it. It’s important to note, though, that motor type is about autofocus speed, not accuracy. The oldest, weakest motor can still focus the lens accurately, just more slowly and noisily. And on a small, consumer grade zoom or prime lens, it probably makes little difference except for noise. How Important is It? Very, if you need fast autofocus, like those shooting sports or birds in flight, especially with large lenses. Not very much, if you are shooting smaller lenses and autofocus speed isn’t critical. Common Marketing Gimmick: Canon’s presenting Micro USM like an added bonus. We all know that the aperture ring is made up of a number of blades that cross to make a roughly circular opening. 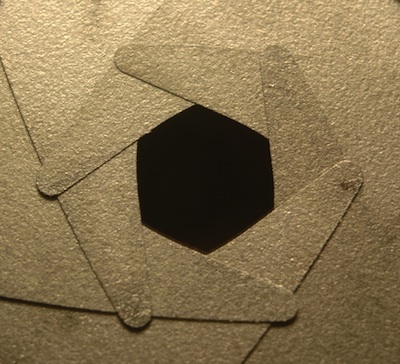 An inexpensive lens will have as few as 5 straight blades, creating an opening that is a pentagon shape. An expensive lens will have 8 or more (a very few have as many as 16) curved blades that make a nearly circular opening. When does it matter? When you have out of focus highlights, they will be more symmetrical and pleasing with a high number of curved blades, so it’s important in a wide aperture lens. Shooting at f/5.6 or f/8, it’s not much of an issue, but at f/1.4 it sure can be. One other effect: when shooting lights at night the number of ‘star points’ on the light will be equal to the number of aperture blades if the number is even, or double the number of blades if it is odd. An 8 bladed aperture gives a nice ‘star ray’ effect, while a 9 bladed aperture (which creates 18 star rays) looks quite different. How Important is It? Not very on smaller aperture lenses (consumer zooms), but can be significant on wide aperture prime lenses. The biggest notable difference is if the lens zooms by extension or internally. In practice almost all super-zooms (more than 4x) will extend when zooming, to varying degrees. Extending is the only practical way to provide that much zoom. Most consumer grade zooms will also, as do many pro quality lenses. Many better zooms in the 3x range zoom (70-200 lenses particularly) zoom internally by moving two or more zoom groups within the lens. Does it make a difference? Not in most cases, although some lenses can double in length when zooming out, which can be a bit of a pain. And for street-shooters and other people trying to be discrete, extending the zoom does announce to the world “I’m taking a close-up of your girlfriend”. Not always a good thing. How Important is It? Not very, unless you have some strong personal preference. There are several ways in which lenses can be focused. In the simplest method, all of the lens groups move as a unit toward or away from the sensor. This all-group focusing is very effective and used in many prime lenses which have rather simple construction. More complex zoom lenses can’t move all the units as a group (there are more units and some move to zoom the lens), so they often employ front unit focusing in which the front unit of the lens moves back and forth to focus. This is a fairly simple method and used in many consumer zooms. It has the disadvantage of requiring the movement of large front elements (slowing autofocus), physically extending the lens length during focusing, and usually rotating the front element while focusing (which makes using filters difficult). Internal focusing systems move a lens group in front of the diaphragm but behind the front element group to focus the lens. This overcomes most of the disadvantages of front unit focusing: the lens doesn’t move in and out, the front element doesn’t rotate, and the autofocus motor can move this small group of elements quickly. Unfortunately, internal focusing often has the side effect of making the focal length of the lens decrease when focusing on nearby objects. (Some 70-200 f/2.8 zooms suffer this effect: they are 200mm when focused at infinity, but only 147mm when focused on a close object.). The faster autofocus and lack of rotation of the front element more than make up for this in most cases, however. Rear focusing lenses move an element group behind the diaphragm (between the diaphragm and the camera) to focus. The effect is similar to internal focusing, but autofocus may be even faster (rear elements are smaller) and there is less reduction of focal length at near distances. How Important is It? Very important, if fast autofocus speeds are needed. Moderately so, if you intend to use polarizing or split neutral density filters frequently. Not critical otherwise. Most lenses have more field curvature, aberrations, and decreased sharpness when focusing on objects close to the lens than on objects further away. This can be corrected by adjusting the distance between some of the elements when focusing, a term called “floating elements” or “close-range correction”. It also corrects astigmatism and helps maintain a flat plane of focus. How Important is It? Very, for lenses that will do close-up work, but not at all for long distance shooting. While the manufacturers don’t publish any data on this, almost every review site does, because it’s easy to check. Most consumer grade zooms, and even some better ones, will exhibit barrel distortion (parallel straight lines bow out towards the edge of the image) at the wide end and pincushion distortion (parallel straight lines bow in toward the center of the image). The degree varies a lot, from barely noticeable to extremely noticeable, and the greater the zoom range, in general, the greater the distortion. It can easily be corrected in post-processing, but some people don’t like to spend the time and the inevitable small loss in image quality. How Important is It? Very, if you shoot a lot of architectural work, not as much if you do naturescapes. As a general rule, brides really, really don’t like barrel distortion in their wedding pictures, but they’re often OK with a bit of pincushion. This is another thing that you can’t put a numeric value on, and bench lab review sites don’t usually test for. However, almost every field reviewer will check for it and it’s something you can easily do yourself. And it’s critically important, especially for wide angle lenses, which don’t really have effective lens hoods, and super-zooms, which have fairly ineffective hoods, too. (The hood has to be out of the image at the wide end, which makes it ineffective at the long end.) It’s not just the visible flare that’s important, but the flare also markedly reduces contrast throughout the image. How Important is It? It may be the most important quality of ultra-wide lenses. Focus shift only occurs in wide-angle lenses. When the camera uses autofocus, it opens the lens to its widest aperture, autofocuses, then stops the lens down to the aperture you’ve chosen and takes the pictures. Some lenses will shift the plane of focus slightly when they are stopped down so the actual image is no longer in focus. In practice this is only important from wide open to f/2.8 or so. By f/4 the depth of field has increased enough to compensate for the focus shift. But there are certain lenses that should be shot either wide open or stopped down a fair amount, not stopped down a little. How Important is It? Only pertinent for wide-aperture prime lenses, but it can be a deal breaker for those. The sensor in the camera is perfectly flat, but the plane of focus of the lens may not be. Let’s say the center of the field of view of the lens is focused 12 feet away from the camera. In an ideal situation, the edges and corners would also be focused 12 feet away from the camera, but if the plane of focus is curved, the edges may actually be focused 8 feet from the camera. Usually, this isn’t to important since we’re most interested in the center. But it can be extremely important if we focus-recompose (focus on the object of interest then turn the camera slightly to move it in an effort to make a more interesting composition). If the plane of focus is curved, the subject might now be out of focus. It can also be important when corner to corner sharpness at wide aperture is needed. How Important is It? Mostly pertinent for wide-aperture prime lenses with a narrow depth of field, and for some landscape photographers. Let’s take a look at two very good telephoto zooms, the Canon 70-300 f/4-5.6 IS and the 70-200 f/4 IS. The consumer grade 70-300 has one UD element. It is front focusing so the front element extends and rotates during focusing. It has a 6 group zoom and the barrel extends and rotates during zooming. It does not have ring USM motor, so the combination of front focusing and geared motor makes it a bit slow to autofocus, although being a small lens, it’s not markedly slow. Its closest focusing distance is 4.9 feet. Despite what I present as negatives, it’s an excellent lens, one of the better prosumer zooms. The 70-200 f/4 IS lens has one fluorite and two UD elements, internal focusing (so the front element doesn’t rotate or extend during focusing), and 7 group internal zoom that does not extend the lens during zooming. It can focus as closely as 3.9 feet. It has a ring USM and an internal focusing system, so its autofocus is much faster than the 70-300 IS consumer zoom. If you read the reviews of these lenses written by owners at sites like Fred Miranda or Canon USA, you can see that almost everyone who owns either of these lenses is very pleased with the sharpness of their lens. While MTF charts and lab tests will show the 70-200 f/4 is sharper, the 70-300 is pretty close and virtually nobody complains about it being soft. But in reading reviews of the 70-300 there are occasional comments that the focus motor is noisy, autofocus is a bit slow, and it can be a pain to use filters. Just what you’d expect, really. Are the advantages of the 70-200 worth twice the price of the 70-300? Certainly for some people who want faster, quieter autofocus; a bit more aperture; and a non-rotating front element. Others would rather have the extra 100mm of focal length and the lower price of the 70-300. Our experience reinforces this: every month or so we’ll have someone rent the 70-200 f/4 and tell us later that they were disappointed, because they thought it would be much sharper than their 70-300 and it wasn’t. They can’t understand why anyone would pay that much money for the L lens since there wasn’t a dramatic difference in their images. Others will rent the 70-200 f/4 and rave about how much faster the autofocus was, that they’d never go back to their old lens. Different people have different needs. That’s a rather simple real-world comparison, though. If you want to get complex, go start a thread somewhere titled “which 50mm prime” or “which wide-angle zoom is the best” and let the fun begin! You’ll get pages of opinions. You may already have opinions on that topic yourself. But, do you know which zooms have a floating element, aspherical elements, low dispersion glass or low barrel distortion at the wide end? Or which prime has focus shift and a curved plane of focus? Those points may be much more important than which has the best MTF chart or which tested out the sharpest in the lab reviews. Oh, and for those who’ve noticed, yes, I completely left Image Stabilization out of this discussion. That’s an entire article by itself.